The 12th edition of the Aero Electric Connection book Chapter 17 is titled Electrical System Reliability. In this CH, Bob introduces us to a Cessna electrical system, then provides reliability improvements. Bob expands the Avionics Bus to serve as an Essential Bus, and then replaces the Cessna avionics master with a diode for its normal power feed. The alternate power feed from the Battery to the Essential Bus shown in the CH17 example is a simple switch. This improvement over the Cessna system removes the 1 amp draw of the Batter Contactor. Thats Great, I love it. But, when I check out the Z-13/8 diagram, it shows an S704-1 relay....supplied by B&C. 1) Why don't we use a switch as discussed in Ch 17? A relay can be used for remote control. That allows the circuit to be shut off near the battery without running always-hot wires into the cockpit. Shutting off power near the source is important in case of smoke in the cockpit or in case of an imminent forced landing. A small switch can control a relay. A relay can control a larger current. The relay manufacturer's data sheet will state the current draw. I think that the current will be less than 1/10 amp. source was the SD8 alternator . . .
was on the order of 0.6A. loads during battery only operations. new battery endurance to 4 hours. from the battery bus through a fuse of 7.5 amps or less. a landing that was really hard to walk away from. are MANY times faster than breakers). This conversation took place years before Z13/8 . . .
the SD8 was an obvious choice. after loss of main alternator. AT THE BATTERY protected by a 10A fuse. feature in Z13/8 revision T.
I feel like I am starting to dissect an onion....so many layers. Your explanation of the TC design goals makes clear the need for the contractor. The Load analysis information you just shared must be my next path to start exploring. This will be ton of fun to figure out. I know of nowhere that an aircraft builder can get clear answers to questions based on truth and principle and void of opinion and heresy. 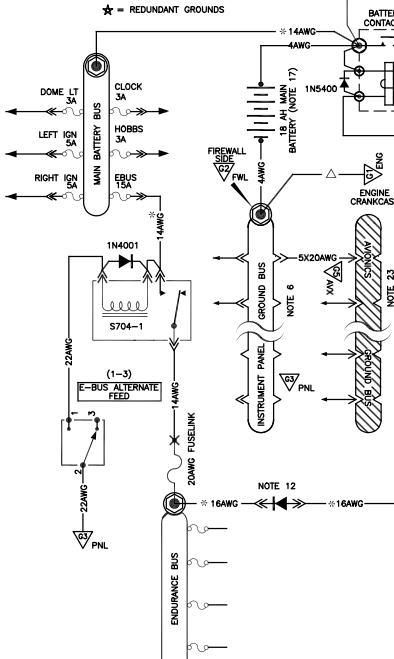 I took a screen shot of a small part of the Z-10/8 wiring diagram. Focus with me on the bus tie between the Main Power Bus and the Endurance Bus. 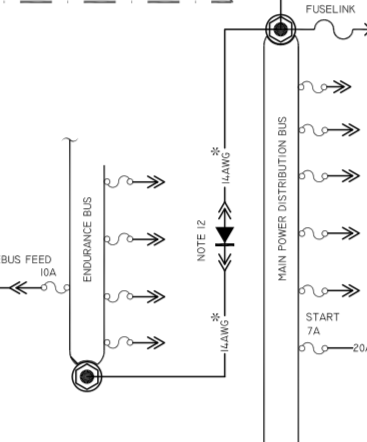 The Endurance Bus gets its primary feed from the Main Power bus thru the Diode, and its typical of the diagrams in AEC. This circuit is unprotected....no fuse, no circuit breaker, no current limiter, no fuse link. I guess thats ok., but seems abnormal. Can I have some feedback? I argue with myself that its because we want a reliable E-bus feed. Then I see that the diagrams in AEC fuse the Alternate Feed from the Hot Battery Bus. I argue with myself that its because we want a reliable E-bus feed. loss of both is exceedingly unlikely. 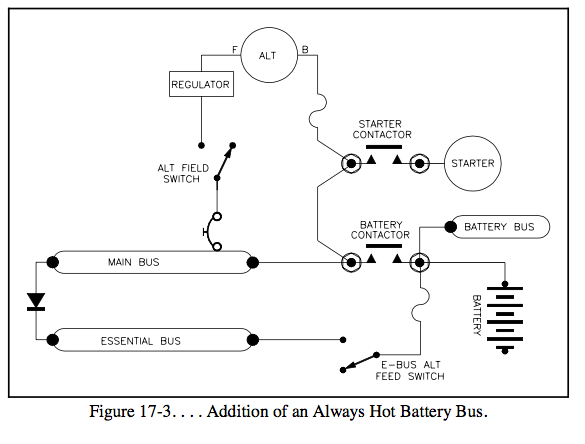 Then I see that the diagrams in AEC fuse the Alternate Feed from the Hot Battery Bus. That's a long feeder that's not so free of risk. Why is there no protection on the feed wire to the main bus from the battery contactor? Assuming the contactor is on the firewall fwd and the main bus is on a sub panel in front of the main panel it’s going to be a wire of potentially a couple of feet long. Same thing could apply to the battery bus. Also why are the amp outputs monitored from both alternators? If the main alternator fails and the amps in/out of the battery is monitored instead of the sd8 output then load sharing might be easier? If you knew that the battery was being discharged would you have an idea what endurance you might have? Most aircraft are wired without protection on the main bus feeder. place for the feeder to short out is where it passes through the firewall. If properly installed, then that will not happen. the battery is running down. Actually an ammeter is not a necessity. Can one assume that a Hall Effect would be installed on one of the three places an ammeter would be installed? It seems logical that a Hall Effect would be placed on the lead from the alternator. Thus, it would correlate with the activation of the low voltage light. How about a shunt? Same locations as ammeter? Suppose you have two batteries. Hall Effect on the alternator lead and shunt on the second battery + lead? It is up to the aircraft builder to decide how many and where to locate current sensors. It does not matter if the sensors are shunt or hall effect type, as long as each is compatible with its display. Some EFISs have inputs for more than one current sensor. If a display only has one input, a selector switch can choose which sensor to connect to the display. Your plan to use one hall effect sensor and one shunt sensor will work, provided that the sensors are compatible with the display(s).